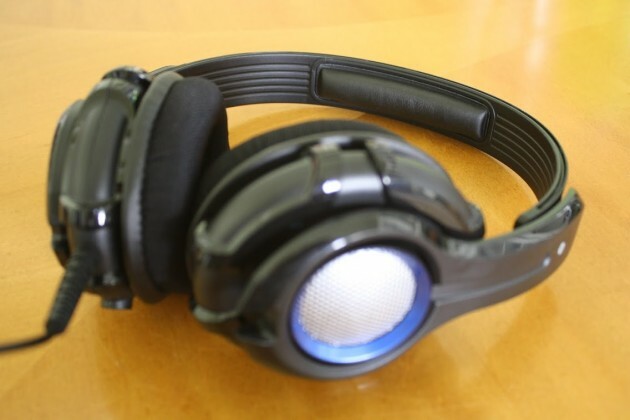 Today we’ll be taking a look at the GamesterGear P3210 Cruiser stereo headset. Geared towards both console and PC gamers, the Cruiser offers a very unique “rumble” feature provided by a 30mm bass driver on each earcup. The headset is made a combination of matte and polished hard plastic. It has a closed back, circumaural design and is driven by dual 50mm speakers at 32 ohms in each earcup. GamesterGear have managed to squish another 30mm 16 ohm bass driver in there as well, used exclusively to create a rumble effect as you game. The cups are lined with a mesh covered foam pad for cushioning. The headset’s most striking feature is the blue ring and mesh lining behind the earcup. Depending on the model you purchase, this blue can either be a green ring (Xbox 360) or a black badge (PC only) with the GamesterGear logo. The headband is very minimally cushioned—a 3.5in piece of foam on the underside of the frame is all that separates your noggin from hard plastic. Finally, hidden inside the earcup is another piece of thin foam to shield your ear from the driver beneath it. Should they require any cleaning, the earcups are also easily detached via 6 clips. Some force is necessary, here, but we don’t expect you’ll need to do this very often. The mic port is cleverly designed with a twist to lock feature that ensures it stays in place. The 12ft(!) cable for the headset itself is permanently attached with a very robust and flexible rubberized joint to stand up to wear and tear. A note about the length of the cable—the headset is designed for dual purpose console use, as well. Given that the average TV and console setup is further than the 3ft distance PCMASTERRACE enjoys, it’s understandable why GamesterGear chose to quadruple the length. The in-line control panel has a belt clip attached, which keeps control at arm’s length while you use the included velco cable wrap to wrangle the remaining cable. Voice chat, game and bass/rumble power control are all independent of one another on the panel, as well as a mic mute toggle switch. At the terminating end you’ll find a 3.5mm plug for game audio and a USB plug to power the bass drivers. GamesterGear has included an additional RCA converter for PS3/4 use. Rather than a restricted earcup, as most headsets in this price range have, the Cruiser has what I’d describe as almost a ball-joint feel to their cup design. They sit loosely in the outer shell of the headband and have both vertical and horizontal freedom of movement. It’s a clever choice that provides a better fit across the ears overall, and is something I feel should be used more often. 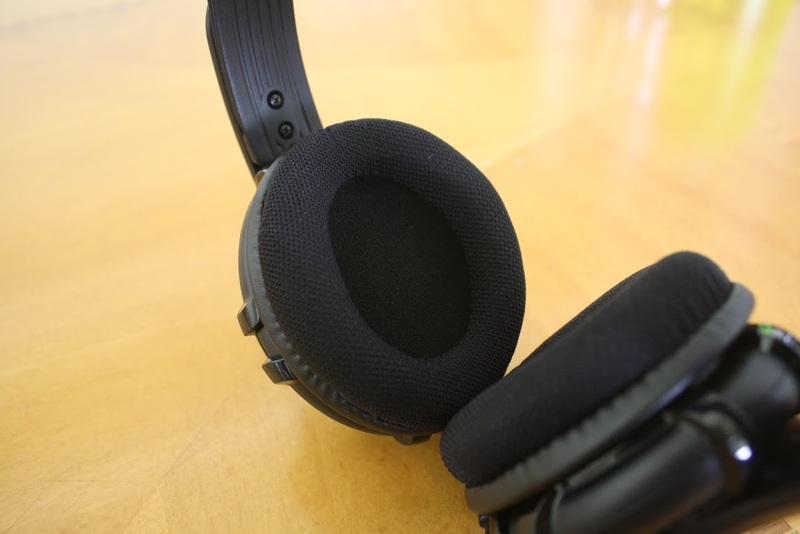 Most headsets have a lot of their shape and comfort derived from the headband itself, since it’s providing most of the supportive hug you’re experiencing during wear. 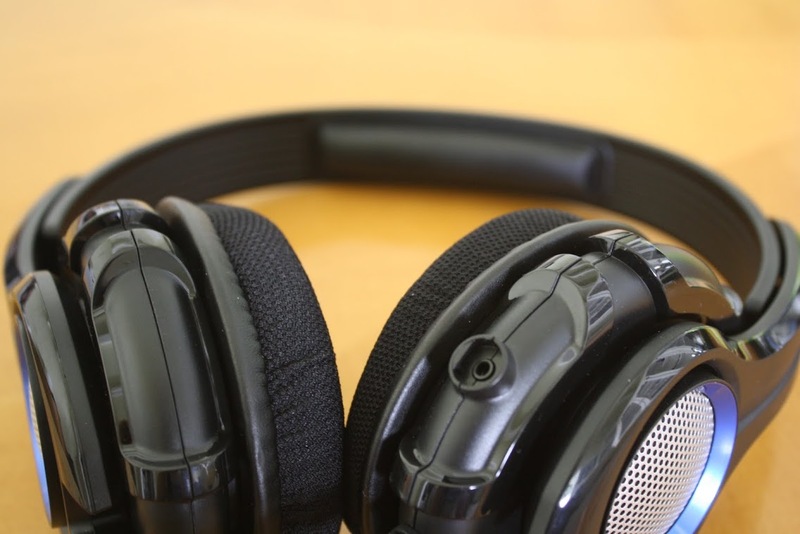 As weird as it sounds, the earcups are what provide the fit on the Cruiser, which relegates the headband to holding them level at the specified height. Putting the fit across the earcup makes sense for this particular model, since they’re primarily driving the rumble effect. Had the cups been fixed, you’d experience a majority of the rumble on the bottom third of the earcup (the likely point of contact for the average head) and lose all the punch they currently provide. Unfortunately, for some, this shape creates a nasty pressure point across the top of your head. The weight of the entire setup is resting on that tiny foam pad, which really doesn’t provide enough comfort here for extended wear on my HuskyHead™. I constantly found myself adjusting the headset slightly forward or backward every few minutes to keep myself comfortable. When my better half tried the Cruiser, she reported no issues—even going so far as to say the fit was so snug across her ears that the headband was merely a suggestion. It serves a stabilizing role more than anything else in this case. In contrast, the headband and its foam bears most of the weight of the headset when on my head. It might be a good idea for GamesterGear to either create a deeper headband cushion, widen the cushion across a larger surface area or both on their next iteration of the headset for the HuskyHeaded™ among us. After having reviewed multiple 5.1 setups, there’s something to be said for the simplicity of plug-and-play. The Cruiser was ready to go out of the gate, no additional setup needed, and provided quite the experience immediately. I was skeptical of how well the rumble effect would work, but ended up being quite pleased with the result. The level of immersion gained can’t quite be described until you experience it. The Cruiser delivers not only the audial boom of an explosion, but the jarring feel of the effect as well. The earthquake of a Titanfall, the demolition of a building and the rumble of a crowd in a playoff setting all take on new meaning. Battlefield, ARMA3, Titanfall, NBA2k14 … there’s an endless list of possible suggestions that all benefit from this clever design. The rumble isn’t overwhelming and can be controlled from the in-line bass toggle if you so chose. It can best be described as the feel of an explosion in a blockbuster movie at the theater. It’s not going to throw you around by any means, but you’ll definitely feel it and appreciate it. Music and movies sound great, but the rumble effect can become a bit tiring. Games with longer audio scores will likely suffer, but movies like Pacific Rim and Fast & Furious 6 (don’t judge me, you know you enjoy it, too) were fantastic. The mic seemed to work well for anyone able to hear my harmonic voice. Mumble testing went off without a hitch. The in-line chat volume toggle is a great added touch—I was able to turn up the chat volume (and turn down the game volume) on the fly without having to pause the action and jump into the settings menu of my game. 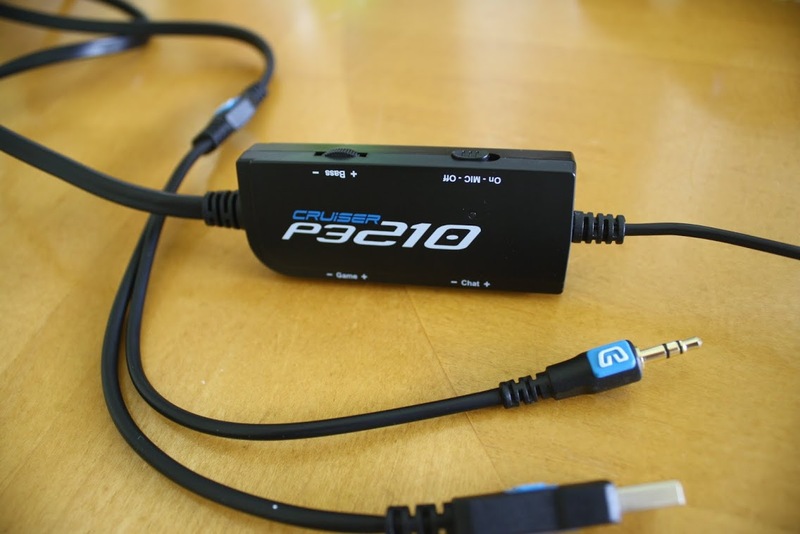 The GamesterGear Cruiser provides a relatively rare offering in the crowded world of gaming headsets. Great build quality, boomy bass and quick setup are offset by an unfortunate comfort design flaw for some. When “precise” 5.1 directional audio isn’t a requirement for your gaming needs and you’d like to experience what you play in a different way, the Cruiser’s “rumble” feature delivers. The GamesterGear Cruiser is available at Amazon for $69.99.